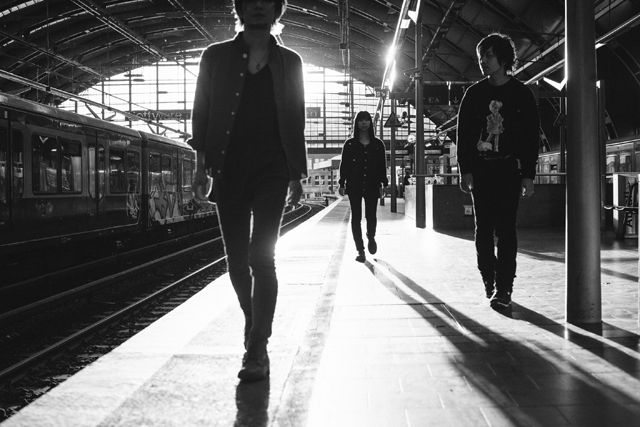 Trio rock band, “Ling tosite sigure” is making a great breakthrough in Japan at the moment. They don’t make appearance in the media so often but word of mouth about the band’s performance is one of factors that boost the popularity of them. Not only their remarkable performance, but the band’s signature sound is also uniquely appealing; on their arrangements, sharp and tough guitar sounds, male-female intertwined high-pitched vocals, strong and steady distorted bass sounds, hard drum play, and progressive beats weave exquisite music… The sound of aggression touches the hearts of people through the albums. The band was formed in Saitama, a city little up north from Tokyo, Japan in 2002. TK (vocal, guitar) and 345 (vocal, bass) started first, and Pierre Nakano (drums) joined shortly. In 2004, they had the nationwide concert tour and sold over 2,000 copies of their indie CDs. In 2005, the band released their first album “#4” by their own label “NAKANO Records”. In 2006, with the release of mini-album “Feeling your UFO” in summer, they launched several tours and performed actively throughout the year. Through headliner tours from spring to summer in 2007 which attracted growing audience, they released the second album, “Inspiration is DEAD” in August, followed by their first single “Telecastic fake show” in April 2008. In December 2008, they signed a major label deal with Sony Music Associated Records and released their second single, “moment A rhythm”, as a limited edition combined with a photo book. In May 2009, they released the third album “just A moment”, which debuted at No.4 on the Oricon sales chart. In 2010, they had a massive nationwide tour “I was music”, which led them to the headlining performance at Saitama Super Arena as SUPER FINAL. Soon after that they experienced overseas performance including “The Great Escape” held in Brighton, UK in May, which turned out to be their first U.K. tour. In September, their fourth album entitled “still a Sigure virgin?” reached the top position on the Oricon sales chart. The single “abnormalize”, originally written for the TV animation series “PSYCHO-PASS” as the opening theme, was released in November 2012. Their long-awaited fifth album “i’mperfect” finally came out in April 2013 and they started out a tour called “Dear Perfect”. Additional dates include their first headliner show at Nippon Budokan subtitled “10th Tornado Anniversary” , as well as the first one night show in Taipei, Taiwan. In November 2014, the single “Enigmatic Feeling”, also the opening theme for animation series “PSYCHO-PASS” following the single “abnormalize”, was released for the first time in a year and seven months.